Elements represent one of the main characteristics of a Dragon which determine their weaknesses and strengths in battle, influence their stats and their offspring during breeding, as well as other interactions either with other Dragons or the environment. Each Dragon has one to three different Elements. Each Element is unlocked at certain Trainer levels. Dragons that have Elements the Trainer has not yet unlocked will not be able to pass them when breeding. Additionally, some Dragons in the game that can be bought will not be available for buying until their highest Element is unlocked. The Elemental order of a Dragon can take different forms, but in most cases, the Elements of a Dragon are in order from base to last, either from top to bottom, bottom to top, or from left to right. In a battle, any Dragon can be tapped/clicked to see its Elements in order from bottom to top, next to its health bar, but when a Trainer's Dragon's turn comes up and the Elements are given for the attack choice, the base Element will be in the middle, the second Element will be at the top and the last Element will be at the bottom. The Elemental order on a Codex Entry is always top to bottom. In the vast majority of cases, the order is left to right when the Elements are displayed on an information panel about the Dragon. All Elements are used as a form of attack in battle. For example, the Fire Element is used as the fire attack. An attack can strike at 3 different levels of strength: strong, medium or weak. The strength of an attack depends on the combination of the attacking Element and the first Element of the target Dragon, namely its base Element. The attack strength is normally a medium-level attack for all combinations, only in some special combinations will the attack become strong or weak. A Fire Dragon will have a strong fire attack against a Wind Dragon, a medium-level fire attack against an Earth Dragon, Water Dragon, Plant Dragon, Metal Dragon, Void Dragon, Light Dragon, Shadow Dragon and any Legendary-Element attack, and only a weak fire attack against another Fire Dragon or an Energy Dragon. Conversely, the Fire Dragon will take strong-level damage from the Water Dragon, Shadow Dragon and any Divine-Element attack, medium-level damage from the Wind Dragon, Earth Dragon, Plant Dragon, Void Dragon, Metal Dragon, Energy Dragon, Void Dragon, Light Dragon and any Legendary-Element attack, and weak-level damage from another Fire Dragon. The Element information button can be used to view Element strength and weaknesses both before and during battle. It can also be accessed while viewing the stats of a Dragon. Elements, along with types, influence the attributes of a Dragon. Elements influence all stats, breeding and hatching time. 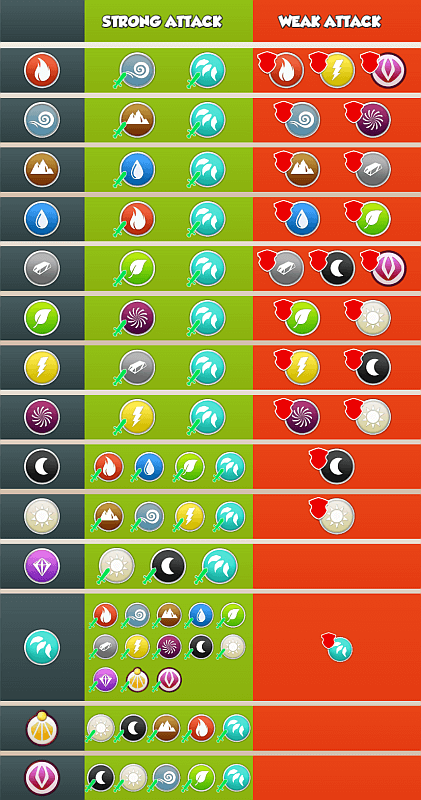 In the case of Dragons with unlockable Elements, their Elements influence their attributes as follows: only the base Element applies to breeding and hatching; all Elements apply to the Base Gold per Hour stat, regardless if they are awoken or not; the secondary Elements apply to the Base Attack and Base Health stats only when they are awoken. All Element-possessing Dragons can make use of all of their Elements upon being hatched. The exceptions are the Legendary and Divine Dragons, which are able to awaken their second Element upon reaching Level 20 and their third Element upon reaching Level 30. Awakening an Element costs 750,000 Gold for the second Element and 99 Gems for the third. Dragons that are currently stored in the Dragon Vault are not eligible for Element awakening until they are retrieved. Update 4.2 made it possible for Dragons preoccupied with timed actions, such as attending the Dragon Academy, breeding and other such processes, to have their Elements awoken during said processes. Starting with this update, only Dragons that do not meet the necessary level requirement or/and are stored in the Dragon Vault can not have their Element awoken. Update 3.1 introduced the Divine Element. Starting with Update 2.3, during a battle, the Elements of a Dragon are now shown as base Element in the middle, secondary Element at the top and last Element at the bottom. Update 1.5 introduced the Light and Shadow Elements, changing the way Elements interact with each other. Starting with Update 1.2, the Elements of a Dragon are now shown in reverse during a battle, with the base Element no longer being at the bottom. This page was last edited on 4 December 2018, at 19:24.